Having recently offered up insights into the training habits for those runners taking on the London Marathon, Strava, the social network for athletes, has also revealed insights into the Boston Marathon from race day data – as well as 12-weeks of training data taken from the 2016 Boston Marathon runners. Athletes training for the Boston Marathon should be prepared to dedicate most of the week to training. On average, men training for the marathon ran 5.3 times per week with a weekly mileage of 41 miles. Women training for the marathon ran an average of 4.9 times each week with a weekly mileage average of 35.6 miles. 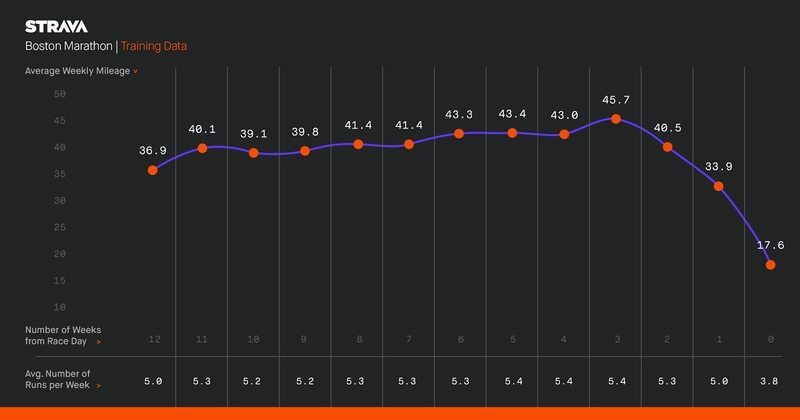 While the average number of runs remained relatively unchanged in the 12 weeks leading up to the race, the distance steadily increased until two weeks from the race. After that, athletes tapered off their distance. The average weekly mileage 3 weeks prior to the race rose to an all-time high of 45.7 miles, while the average weekly mileage the week prior to the race was just 17.6 miles. Athletes’ runs qualified as long runs if they logged 15 miles or more in one session. Boston Marathon runners averaged a total 4.2 long runs over the course of 12 weeks, with the average long distance run coming in at 19.1 miles. The most popular time for runners to train was between 3 a.m. and 8 a.m., with 30% of athletes training for the Boston Marathon logging activities between these times. Boston Marathon runners engaged frequently with the Strava community, taking more than 18,000 photos, receiving more than 1 million kudos, and commenting more than 93,000 times during training. According to Strava data, both men and women experienced their fastest mile at mile 4, and their slowest mile at 21, Heartbreak Hill. Running quickly at mile 4, while a slightly downhill segment, is also possibly an indicator of new-found freedom from the crowded early miles allowing runners to ramp back up to their planned target pace. Strava race day data shows that the younger an athlete is, the more likely he or she had a faster finish time at the Boston Marathon. Considering the qualifying times do get easier as you get older, this isn’t a total surprise. The 24 and under age group was the fastest, with an average a finish time of 3 hours and 19 minutes and an average pace of 7:39. This is followed by the 25-34 age group who finished in 3 hours and 23 minutes with an average pace of 7:47, and the 35-44 age group in third, with an average finish time of 3 hours and 31 minutes and an average pace of 8:07. The slowest age group was 65+ with a finish time average of 4 hours and 18 minutes and an average pace of 9:54. These are some serious athletes. Boston Marathon racers were the fastest to recover, with an average of just 5.4 days of recovery before their first post run race activity was logged. One million new members sign up for Strava every 45 days, and the platform boasts approximately 8 million activity uploads each week globally. In 2016, globally, Strava runners uploaded 86.7 million runs, with the US contributing 21 million of the runs covering 105 million miles.